After several months spent in India, which is not currently selling the Apple Watch, I finally got back to the States and tried one in person. This isn't a full review of it, but rather my impression of it after testing it in store and using friends' Apple Watches. I hope this will be helpful in deciding if it would make sense for you, my esteemed reader. Fantastic physical construction. It's extremely well-crafted. As someone who is a fan of mechanical watches from companies like Rolex, Omega, and Audemars Piguet, I was surprised to see that the quality of the watch is exceptional. Though they're actually quite small and still a bit "gadgety," after trying on the aluminum sports edition and the more expensive steel edition, it feels solid and you can tell it's well-built and will last. Many nice watch bands. You might not think this makes a huge difference, but it does for both personalization and comfort. There are an impressive number of watch bands: steel links, milanese mesh bracelets, various styles of leather straps, and even "fluoroelastomer" bands (read: synthetic rubber). It doesn't replace your iPhone (that's a good thing). Instead of being able to do everything through the Apple Watch, it really only serves as a quick notification center and a window into some of your apps. The limited functionality means you can tailor the notifications that you see to be the most important ones instead of every Facebook or Instagram like that you would otherwise get on your phone. That way if your watch gives you a tap (which is much more of a tap on the wrist than it is the kind of vibration from your iPhone) then you know it's important and non-trivial. Fitness tracking. It has the usual step counter, a game-like goal tracker that celebrates milestones, and even reminders to tell you to stand up if you've been sitting for too long. It's primarily useful for running right now, but they'll soon add more ways to track weight training and other non-cardio exercises with future updates. The built-in heartbeat sensor can even tell when you're doing strenuous activity and counts that towards your daily exercise goal (as opposed to more passive activity like time spent walking, sitting, etc.). Though the step counter is a little barebones right now, you can easily see how it will be an even better run tracker once they add GPS to the watch. It needs your iPhone to do just about everything. This means that any watch apps that aren't made by Apple aren't running on the watch, but rather are running on your iPhone and simply being displayed on the watch. Native watch apps will be coming out soon with watchOS 2, but it will still need to be tethered to your iPhone to go online and get new data. Some of the touted features are gimmicks. Things like sending your heartbeat to someone or sketching a silly drawing are described on Apple's site as "new ways to connect," but in reality they have limited use. First, you can only send these to other Apple Watch owners, which greatly limits who can receive it (unless your whole friend group has Apple Watches). Two, it's a bit repetitive as the Apple Watch's small screen only allows for the simplest of drawings like a smiley face or a sad looking flower. They seem cool for the first five minutes, but ultimately you forget about them. You know it's going to get dramatically better in the next few years so you might as well wait. This is the biggest reason I see for someone not getting an Apple Watch if they have been on the fence. Much like the first couple generations of iPod and iPhone, the Apple Watch is one day going to transform from its current form to something much thinner and even more functional. In a few years, with a thinner case that has GPS and a wireless antenna for connecting to cell networks, it will become a more standalone device. While that hopefully near-future incarnation of the watch will be great, right now, it's a first generation product. A good first generation product, but a limited one nonetheless. I'll conclude by attempting to answer the question friends keep asking me: should I buy one? I can't definitively say no, because, for a version 1.0, it's pretty functional. But I also can't say that you should instantly buy it since I can clearly see how much better a device it will be down the road. Once the watch no longer needs to be paired to an iPhone and can function independently via GPS, Wi-Fi, and (hopefully) it's own cellular data connection, it will be extremely powerful. Until then, I would say that you should get one only if you understand that the Apple Watch is a supplement to your iPhone, not a wrist-bound replacement for it. It's easy to get tired of all the hullabaloo surrounding gigantic bent iPhones, the possibility of ten thousand dollar Apple watches, and paying for overpriced pumpkin spice lattes with Apple Pay. But to me, the most relevant recent announcement from Apple has been their latest mobile operating system. iOS 8 brings a lot of usability changes to the iPhone, most of which are far more subtle than last year's iOS 7 update. Normal people who use iPhones like hearing about marquee features, but I've always gravitated towards the small details that make the day-to-day use of the iPhone better. So after combing through as many articles about the new or changed features in the latest release that I could, I present the esteemed reader with some of the better improvements in iOS 8. They may initially seem very simple, but they can save you time and make your life easier if you're aware of them. Here we go! Unless you've ordered one of the ginormous iPhone 6 Plus models, your battery life with your iPhone is still probably not going to be the 2 day+ battery you've always wanted for binge watching Miley Cyrus YouTube videos. To counter this, Apple's battery usage settings have been dramatically improved and now show which apps are consuming the largest amount of your battery. This way you can either use those apps less or just delete them altogether. Remember that the app which takes up the most battery isn't necessarily evil, it may just be the one you use most frequently. However, for apps which rank highly in battery usage but that you rarely use, consider deleting them. You can get to this view by going to Settings --> General --> Usage --> Battery Usage. If you're on the iPhone home screen and you swipe down (not all the way from the top, but at a midpoint on the screen), then a search box will appear to do your bidding. This is Spotlight. Spotlight can now search several areas of your phone's local storage and online too. It covers general Google search, Wikipedia, maps locations, the App Store, apps on your phone, the iTunes Store, music on your phone, text messages, contacts, emails, and calendar events. And it pulls up instantly. So next time you need to find something on your phone, instead of searching through folders and home screens to find something, it'll likely be quicker to just swipe down and search directly for what you want to find. This one is huge. If you've ever gotten stuck on a large text chain with ten people and quickly come to the realization that you really don't care about meeting up with friends at the nearest Chipotle, this feature is for you. Go to a group thread in the Messages app, press the "Details" button at the top right, and you can now leave an iMessage thread and stop being caught in the back-and-forth of indecisive friends not knowing where they want to have mimosas on a Sunday morning. But if all the participants aren't on iMessage, you won't be able to leave the thread (since the so-called "green bubble" people don't support the leave chat functionality). So the next best thing if not everyone is on iMessage is to turn on "Do not disturb" for that conversation so you won't receive notifications every two seconds. You can find both the leave conversation and mute conversation options by pressing the "Details" button on the top right of any group thread in the Messages app. Widgets give users quick bites of information that are easy to glance at. Android users regularly tell me about how much they love home screen and lock screen widgets. I usually give them a witty retort and carry on playing Tiny Wings, an app that will never come to Android On iOS, the wait is finally over and by swiping the Notification Center down and looking at the "Today" view, iPhone users can glean snapshots of information from their favorite apps. For instance, one of my task management apps, OmniFocus, allows you to see the items due for today. The Evernote widget has one of the nicer user interfaces and allows you to quickly create a photo/note/reminder without having to launch the app. There are a lot of apps that have widgets and that number is only going to grow. To figure out which of your current apps have a widget, navigate to the "Today" view of Notification Center, scroll to the bottom, and press the "Edit" button. I recommend only adding those apps that have the most helpful widgets rather than adding all of them at the same time. Happy Widgeting! We all have that one friend. You know, the one who parties too hard "in da club," blacks out, and loses their phone somewhere during the course of the night. Well, partygoers, this feature will be your new best friend. If you go to your phone's Find My iPhone page (Settings -> iCloud -> Find My iPhone), there's a new toggle for "Send Last Location." This means that right before your phone dies, it'll send you an email with it's last known location and coordinates. This is a very clever feature, especially if you have no clue where you left your phone the night before (or even if someone stole your phone and it ran out of battery while in their possession). That's why, even if you aren't a clubaholic, I still recommend that everyone activate this setting. 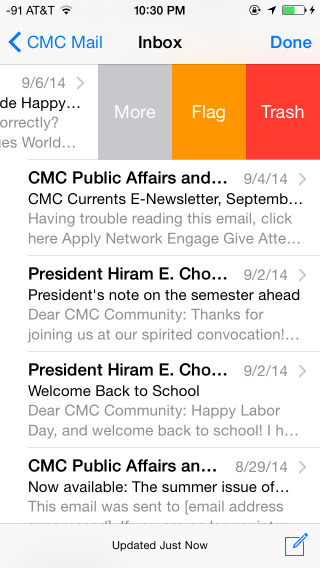 For the more business-minded among you, the revamped mail app has tons of usability improvements. For starters, if you've ever wanted to get notifications on a single email thread (maybe an important conversation between you and your boss regarding those TPS reports that you haven't gotten around to), now you can do just that. Swipe partially to the left of any single message, press "More," then press "Notify Me." This will send you a notification for that single thread whenever there's been a response. This way, you don't have to turn on Mail notifications for every single message, as that can get pretty exhausting after a while. Next, if you're in the process of writing a message and need to reference another email, you can now drag from the top of the message you're writing (where it says "New Message") all the way down and have that draft at the very bottom of the screen. This frees you up to refer to other emails while parking your email-in-progress for quick access later. This is probably the handiest new feature of the Mail app and it's about the closest to split-screen multitasking as Apple has gotten. 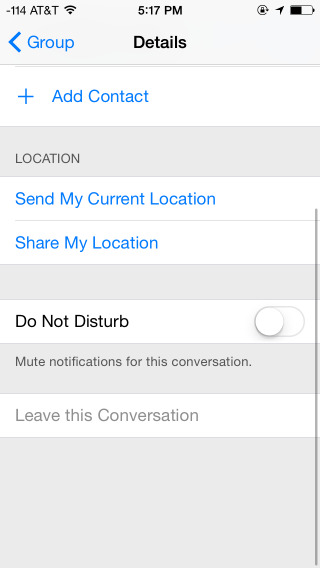 This list isn't exhaustive by any means, but I think these are some of the cooler, lesser-known features of iOS 8. Let me know what you think and if you'd like to see more posts like this in the future. Tim Ferriss is the author of the New York Times bestselling “Four Hour Workweek” and a Silicon Valley angel investor and advisor. His books are all about how to maximize output with the minimum effective dose of input, whether it’s learning a new language, optimizing your work schedule, or working out at the gym. Being somewhat of a renaissance man himself, he interviews some of the most interesting entrepreneurs, authors, tech founders, scientists, and even chess prodigies. For this one I recommend finding an interesting interviewee and diving in. Especially good are his “in-betweenisodes” that are shorter and focus on simple productivity advice that you can easily put into practice. The show formerly known as Quit! is about career choices, starting projects on the side, and how to make big life decisions. It’s hosted by a well known tech podcaster, Dan Benjamin. He usually has a co-host or guest to discuss making changes like quitting your current job, pursuing graduate school, how to negotiate, working with annoying bosses and everything in-between. They often have live callers or read emails from listeners who are on the cusp of making big life changes. You can start by listening to the most recent episode and seeing if it’s for you. A Brit, an American, and an Italian walk into a bar….Connected is a "weekly panel discussion on Apple and the impact of technology on our lives.” The show was formerly called The Prompt and ran for 57 episodes, but was recently relaunched. This is definitely the most international show on the list, as the three hosts/friends are spread across Europe and America, but come together to discuss Apple, related tech trends, and general nerdery. They do some other podcasts that are offshoots of this one, but this show is the one that started it all. If you’re interested in Apple/tech, I’d jump in at the current episode and see if you like it. Ask Altucher is a daily podcast by James Altucher, an entrepreneur, investor, author, and all around crazy person. He’s known for writing in an extremely honest way about how he made millions selling companies, only to lose his millions over and over again. He’s definitely one of the more interesting podcast hosts on this list and each day his host asks him any question that listeners submit. Sometimes his answers and advice can be really amazing, and at other times not so much. Since it’s a daily podcast, each one is only about 10-15 minutes and sometimes shorter, so it’s a pretty low barrier to entry. I would choose any topic that sounds interesting and listen from there. I only recently found out about Microphone Check (thanks Kevin! ), and it’s a pretty incredible look into the world of Hip-Hop artists. If you have an interest in rap music and those who are involved in creating it, this is a great place to get some amazing anecdotes from legendary emcees and producers. The interviewers are Frannie Kelley from NPR Music and Ali Shaheed Muhammad, who was the producer for A Tribe Called Quest. Together they ask about all kinds of things, ranging from what it’s like working with Kanye West to what it was like when Nas came out with his classic first album, Illmatic. The best way to listen is by finding your favorite rapper and pressing play. I think I could have include about three more tech-related podcasts, but I wanted to include several different topics so that there’s something for everyone. This past week, at Google's annual I/O Developer Conference, the company announced that smartwatches with Google's "Android Wear" software would be available for pre-order. The most interesting of any of the wearable devices was the Moto 360, which has a circular display that looks the most like an actual watch when compared to competitors like the Pebble or Samsung Galaxy Gear. The Google smartwatches allow you to check incoming texts, emails, calls and also let you speak to the watch to find directions, look at your calendar, and consult with other features via Google Now, the company's intelligent assistant software. While this initially sounds cool ("Nice, I don't have to pull my phone out every two seconds! "), it's actually pretty boring and uninspired. There are a few reasons for this. First, any of these modern smartwatches aren't actually that smart on their own because they always need to be tethered via Bluetooth to your phone. You can certainly check various messages and events on your wrist, but to do anything beyond that, you'll have to pull out your phone as usual. And even though Google is encouraging users to issue voice commands to control the watch itself, I'm definitely not going to be caught dead shouting at my watch for directions to the nearest Starbucks (see the movie Her for an idea of what that bizarro universe looks like). So while these smartwatches are decent windows into your smartphone, until you can use them without your phone (or without looking like an idiot), they won't be that useful. It's also simply annoying to have a smartwatch the buzzes/beeps/yells at you every time you get a notification about anything. One tech writer who got to test a Google smartwatch expressed his frustration at the constant email pop-ups, text messages, and continuous shenanigans that the smartwatch would alert him about. While you can, for instance, easily mute all email notifications, that doesn't make the watch especially smart. After all, the whole point of a "smart" device is that it tells you what's going on in your world when you need to know. A better solution might be that you could selectively choose which emails from which people buzzed your wrist at certain times (e.g. only showing emails from your boss unless you're on vacation). But no smartwatches currently have this granular level of control, so it's all or nothing when it comes to your notifications. And finally, one of the biggest issues with this new crop of smartwatches is that the interaction with them is extremely limited. Most smartwatch apps only display information and other than the usual swiping and tapping that people are used to on their phones, you can't do much else. The voice control that Google is trying to implement indicates that they're at least trying to experiment with new input methods, but until voice gets better or they develop another solution for smaller device interaction, the smartwatch will just be a miniaturized version of the smartphone. Because current smartwatch makers are creatively constrained by the recent success of smartphones and their interaction models (tapping, pinching, swiping, etc. ), they haven't yet devised unusual ways of interaction that work for these wearable devices. In just thinking about how some fine, mechanical watches work (see the Rolex Sky-Dweller), it would be an interesting experiment to see how a rotating watch bezel that controls the digital screen would work in conjunction with voice features. This would be similar to the old style iPod click-wheels from the pre-iPhone days and wouldn't even necessarily need a touchscreen to work well. Now of course, these are the very early days of the so-called "wearable revolution," but I'd love to see Google, Apple, Pebble, or some ambitious newcomer seriously think about different interaction methods while also researching how normal people use normal watches. After all, with a standard watch, you look down at its always-on display and glean information from the dial. You might run the stopwatch on a chronograph or adjust the second timezone hand of your GMT watch when you travel, but interaction is usually very fast and helpful. That's why rather than starting with a smartphone and making it smaller, it would be far more interesting to start with a watch concept and work backwards from there. This ensures that a smartwatch has utility and becomes more that just a dumb window to your actually smart phone.